Seriously, too busy with family, new games and Blu-rays to post updates. Back to normal starting today. On a non-gaming related front I recently watched the Top Gear North Pole special and boy was it fantastic. 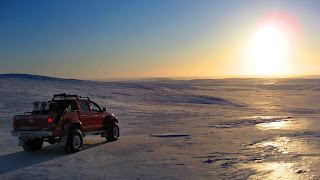 The goal was to see if they could make Arctic exploration easy by using the absolutely amazing Toyota Hilux Arctic truck. If you are fans of the show you would know the older...umm.. softer gentlemen Jeremy Clarkson and James May drove the truck and the younger, fitter Richard Hammond tried to beat them using conventional methods (dogsled, skiing). The episode was amazing with both sides facing enormous challenges, sleep deprivation, biting cold and hardships during the long trek. Don't assume the truck wins as they faced nearly impenetrable ice boulder fields and melting patches in the Arctic Sea. Seriously find this episode and watch it, during the show a friend asked if I would do this kind of thing and the answer was immediately YES! This would have been an adventure of a lifetime and even though everyone was miserable, in bad temper and near dementia with exhaustion you know they will talk about this for the rest of their lives. I feel quite annoyed this video wasn't available in my area. Yeah... made realize how much I do not like winter.